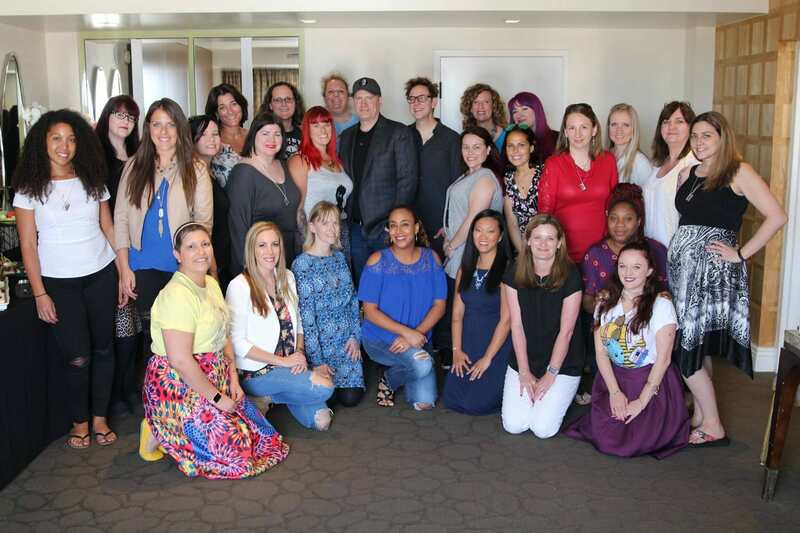 My favorite part of making the Guardians movie is meeting with the Mommy Bloggers. That’s no joke. That’s 100% true. 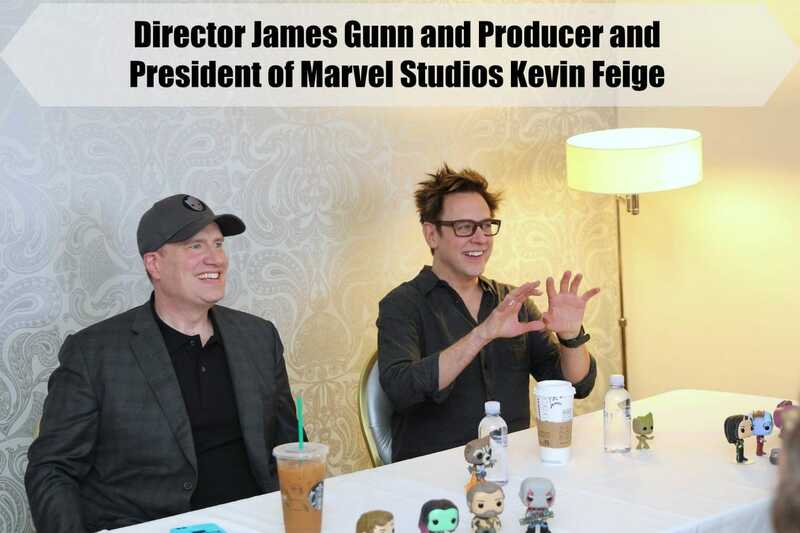 … and Kevin Feige agrees! James and Kevin did let us in on some scoops about the music, how they pick a director, and who the voice of Mainframe is. The Guardian’s of the Galaxy movies are known for their amazing music. Seeing as I was born in the Seventies, I love all the music in the first film and we asked about how James finds and chooses the music in the films. James: I have a list of about 500 songs, which I think of as, like, Guardians-type songs that Meredith Quill might really love. When I’m going through and I’m writing the script, I put the songs into the script where they seem to fit. And sometimes I don’t have a song that seems right on that list, and so I have to go out and search and listen to a bunch of stuff, and see what I like. But eventually, it’s all basically baked into the organic story of what’s happening in a movie, in the same way you put sugar in a cake. There was one song that came from Twitter. Kevin: Somebody could find it. That’s a fun idea. Kevin: What’s so amazing, and it was like this on the first one, and held to it on the second one, a lot of screenwriters put song suggestions into their scripts, and almost none of those songs end up in the actual movie. James did that, I think even maybe on an outline in the first movie, and certainly in an outline on the second movie. On the first one, it was like, “Oh, that’s cute. He thinks these songs are gonna be in the movie. We’ll see.” Every single song. It’s not just the movie. But what’s perfect for the movie. Then on part two, I knew better. So, would listen to the song as I’m reading the outline, and then later the script. And that sort of pool of songs that he has comes in handy. There’s a Guardians of the Galaxy theme park ride that is opening soon at California Adventure that features songs that James suggested as well, and a few other places coming up in the future. James: That’s a hot scoop. Kevin: There’ll be songs in the Guardians ride. James: Yeah. Chosen by us. As it has been well talked about, the Guardians of the Galaxy will be a part of the new Avengers movie slated for next year. We tried to get an inside scoop but were unsuccessful. We did ask about how they were going to successfully integrate the Guardians into that franchise. Kevin: As with all of the connectivity between our characters on various films, you have to be careful about it. I mean, we never want it to just seem like characters are popping their heads out of windows and saying “Hello” and then going back in. James: It’s a whole movie of Stan Lee cameos. Kevin: Believe me, it’d be easier to do it that way, but it’s — but it wouldn’t be as satisfying. So a big role, a small role, regardless of the actual screen time that any single character has, and I think you’ve seen this in the Avengers films, and in Civil War last year, it’ll be very meaningful and very important to the story that we’re telling. That film’s shooting right now and we’ve already shot a lot of those interactions, and it’s very exciting. Who is the voice of Mainframe? James: Miley Cyrus. A scoop. That’s a real hot scoop. Yeah. Miley Cyrus has a cameo in the movie. Kevin: Mainframe’s the talking metal head at the end. James: And then I got her to do it. Speaking of cameos, obviously, it’s a family film, your parents were in it too, right? James: Yes. My parents. My parents are in it. My brother. My brother’s wife. My two nephews and my niece are all in that scene. Yeah, you know, I kill a lot of my family members. It’s not quite “aww.” It’s more like, ya know, “grr.” That’s my parents. That’s my dad, they’re credited in the credits as “weird old man” and “weird old man’s mistress.” Which my mom loved. My mom loved it. Kevin is pretty amazing when it comes to picking the right directors for each of his films. 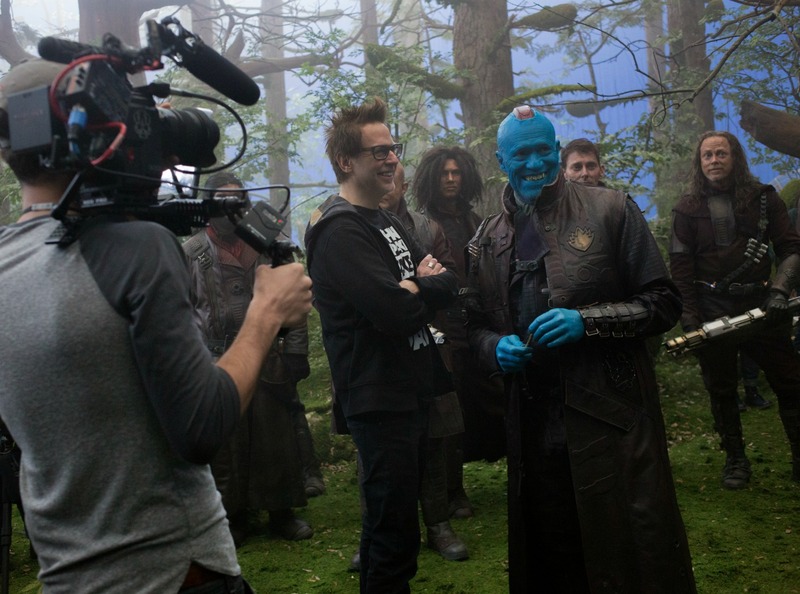 We asked him about his process and how James got the directing role in the first Guardians. Kevin: Well, there are a lot of meetings, and it’s really — it’s a leap of faith, to some regard. And a lot of it is, “is the vibe — and do we want to spend, you know, in a worst-case scenario, three years together, and in a best-case scenario, you know, ten years together? 12?” We have a great team at Marvel Studios. 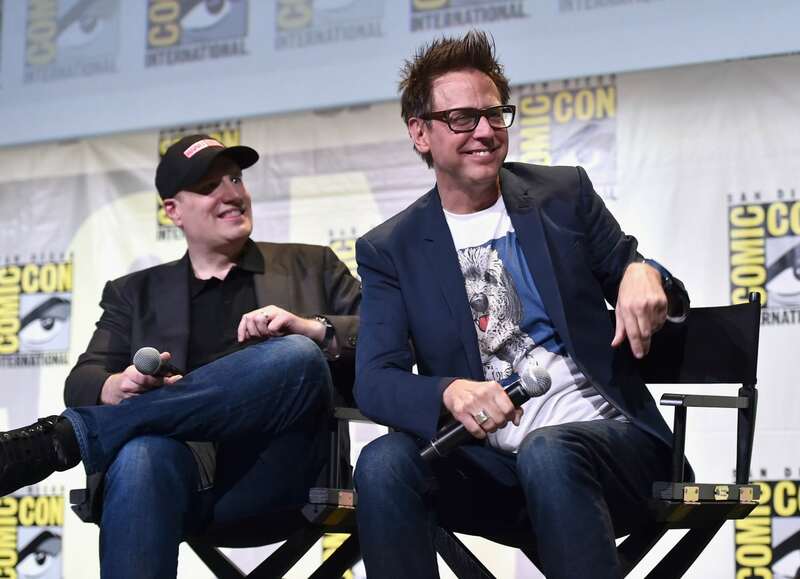 And in the case of Guardians it was executive producer Jeremy Latcham and now executive producer Jonathan Schwartz who did the first round of meetings, and they were the first people James met with. And sort of pitched the notion of this weird space movie with raccoons and trees. And as James — what was it? You were driving home after that meeting? And so I kind of smiled and shook their hand and I went home, and I didn’t really think I was going to take the gig, or that wasn’t being offered the gig, but I didn’t think I was going to pursue it in any way. And then on the way home, it like, it hit me. It really, really hit me, and it was like seeing the first poster in my head on the way home, and I realized what this movie could be, and how it could bring color and heart into a big, franchise film, and create the kind of space opera that I’ve wanted to do my entire life, so that’s how it started. And this is being completely honest. It’s like, I had a lot of success doing things in Hollywood, and I always considered that my strength was that I didn’t really give a sh*t. Like, I would go in and I would pitch something, and I’m like, “Well, if I get the job, then I’m gonna get money. But if I don’t get the job, then I don’t have to work for a little while, and you know, I’m very lazy.” This fact that I didn’t care, I always thought it was my strength. And for the first time in my life, I really — I really wanted the Guardians of the Galaxy gig. That honestly had never happened to me before. I had never done it. 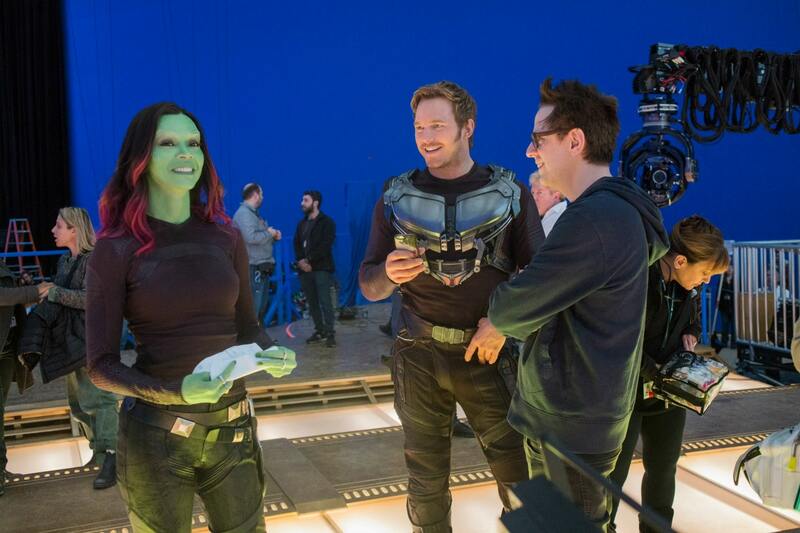 And so it was a new experience for me in caring, and it’s so funny because that’s exactly what the Guardians are about. Guardians of the Galaxy Vol.2 is in theaters now, buy your tickets today! I will be back tomorrow with my last exclusive interview with Michael Rooker (“Yondu”) & Sean Gunn (“Kraglin”)!